The World Bank, Food and Agriculture Organization, and International Rice Research Institute produced the Lao PDR: Rice Policy 2012 report. This study is a first attempt to analyze rice sector in Laos through an in-depth analysis which combines technical aspects of rice production with a broad-based socio-economic analysis. The Lao government commissioned the report. 173 pages. Lao rice production has been increasing significantly since the early 1990s. It was driven by area expansion and increase in yields. Rice production in Laos has more than doubled over 1991–2011, and reached around 3.3 million tons of paddy in 2011. While Laos has still one of the highest per capita annual rice consumption levels in the world, there is evidence that it had reached the peak in mid-2000s and is now on a declining trend. 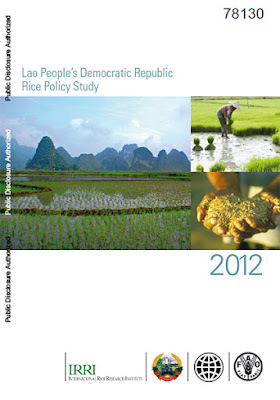 Today, Laos has achieved rice self-sufficiency at the national level. At the regional level, there are differences in rice self-sufficiency among the provinces, with the major rice deficit areas being in the north. However, rice insufficiency does not necessarily mean food insecurity as farmers are increasingly diversifying into export crop production. Farmers are moving increasingly out of rice production. The proportion of rice-growing households has decreased from 77 percent of all households in 1998/99 to 71 percent in 2010/11. The rice milling sector is underdeveloped and inefficient, which makes it difficult for its milled rice to compete in regional and international markets. Facilitate trade. To be more competitive, eliminate export bans and create a more transparent export environment for rice and paddy. There is interest from Thailand, China, and Vietnam in importing cheaper Lao paddy, which could be milled in their countries and sold on domestic or international markets.